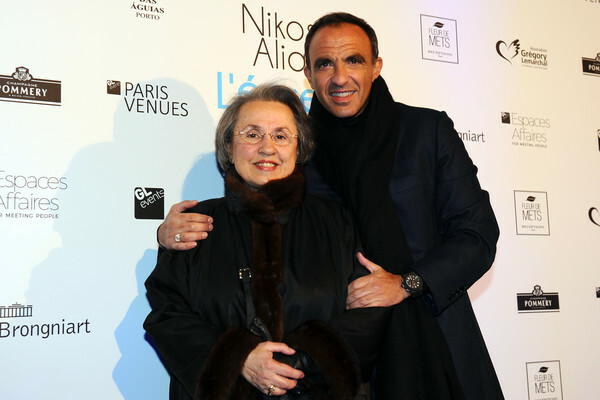 Franco-Greek TV and radio presenter Nikos Aliagas (R) and his mother pose during his The exhibition 'The Test of Time' at Palais Brongniart on January 16, 2017 in Paris, France. Nikos Aliagas has been passionate about photography since an early age and is currently showing his work in his exhibition 'TheTest of Time'. Aliagas has a soft spot for hands and he has photographed the hands of French actor Gerard Depardieu and rapper JoeyStarr. Nikos states "I love taking pictures of hands because you can't change them, they will always be the same and they carry the weight of time.